Perhaps the most prized piece of real estate throughout the University of California, San Diego, is the seven-acre site of University House, home to the UCSD chancellor. The rambling adobe home, with its row of south-facing windows, its patios and portales, was built on the precipitous edge of a canyon. From the back patio the view of the Pacific’s blue horizon and La Jolla’s benign cove is spectacular. The residence, in the La Jolla Farms enclave west of UCSD, has been used to entertain wealthy San Diegans who, with the chancellor’s persuasion, donate to the school. Four years ago, due to structural problems, the residence was declared unlivable. Since then, the university has sought to demolish the home and replace it with a larger one. But this plan has brought the ire of historic-home preservationists who oppose tearing it down. It has also brought opposition from Native Americans, whose ancestors once lived on and buried their dead on the site. In fact, University House is perched on a Native American cemetery. In the last century, the ancestral remains of the Kumeyaay have been removed from the site, angering the tribe. The Kumeyaay believe that any digging into the area they call Skeleton Hill desecrates the dead. On top of the fight to prevent further disturbance is the Kumeyaay’s frustrated attempt to have remains previously removed repatriated so the tribe can rebury them. In 1949 Black and his wife hired the noted architect and painter William Lumpkins, of Santa Fe, New Mexico, to build a large adobe home in the Southwestern style. Lumpkins was an advocate of this style, also termed Pueblo Revival. The home, modeled on Native American pueblo architecture, features exposed-beam ceilings, long covered porches, and adobe-brick walls, whose stuccoed surfaces are painted white. The home is one of few adobes ever built in the county. The 11,400-square-foot U-shaped building includes the chancellor’s residence (4000 square feet) and a facility for public meetings and parties (7400 square feet) where university donors are feted. Meet-and-greets range from lunches for 12 to receptions for 250. From 1967 until 2003, six chancellors have occupied University House. Richard Atkinson was chancellor from 1980 to 1995. He was succeeded by Robert Dynes, who served for seven years. As late as August 2003, Dynes and his wife, Frances Dynes Hellman, hosted Irwin and Joan Jacobs, Richard and Rita Atkinson, and a few dozen others at a gala chamber music concert on the property. By the end of the year, Dynes was leaving to become president of the University of California. His replacement, Marye Anne Fox, has never lived in the house and instead has lived in a La Jolla home, leased for $6500 per month. Dynes was the catalyst for the University House project. 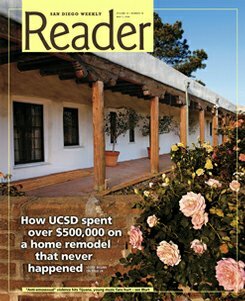 In January 2004, as UC president, he directed UCSD to hire Island Architects to investigate the property’s condition, for which the firm was paid $108,000. Island’s study showed that the slope was falling (three of the seven acres are eroded slope), the house had numerous code violations, the drainage was improper, and the house needed an earthquake retrofit. The next step was to set up a committee that would develop a plan either to renovate or replace the home. The group Dynes chose consisted of university administrators, faculty, and students. Although there was one “community representative” — the founder of a real estate investment company — no Native Americans were on the committee. The committee’s study was finished in August. The report found that University House had “no architectural significance,” but it did have “cultural significance” in La Jolla history. The home “has a special place in the hearts and minds of some in the community.” Some alumni and members of the UCSD Foundation wanted to retain the current property. Three options were suggested: the house could be renovated, demolished and replaced, or sold. Each option had its price: renovate, $5.8 million; demo and replace, $7.2 million; and rebuild elsewhere, $7.7 million (although selling the house might bring as much as $16 million). No matter which option, something needed to be done: the wiring was inadequate, the public area of the home had only two bathrooms, the heating system needed replacing, and so on. Though renovation cost the least, this option wouldn’t expand the home to more comfortably accommodate meetings, parties, and events. In addition, mere renovation was “not fiscally prudent” because given the “potentially costly unknowns typical of renovation projects,” the estimate might prove too low. Selling the home and rebuilding elsewhere was not recommended because the oceanfront property had greater emotional than economic value and because UCSD didn’t want to site a new home on land that might later be needed for classrooms, lab buildings, or parking lots. The committee recommended that University House should be demolished and rebuilt, as long as “archaeological, environmental, and community” concerns were resolved and enough private funds were raised by January 2005. Otherwise, the committee should reconsider selling the property. Courtney Coyle is a La Jolla attorney who advocates for Native American rights. Coyle believes that a new home was the default position before the committee made its assessment. With a Public Records Act request, she acquired UCSD emails written in 2004 which she says show that the university had decided not to take care of the home because they wanted it replaced. The donor voyage began in the fall of 2004, but by January 2005 it had gone nowhere. The Union-Tribune reported on March 10, 2005, that since fund-raising had foundered, the school had sought an extension. Sometime in April 2005, UCSD had changed course: the university decided to sell the home and property. But once a sale became known, warning shots were fired. The La Jolla Historical Society announced it would fight any new owner’s attempt to demolish the home. A neighborhood homeowners’ group was investigating how it might get the house listed on the National Register of Historic Places. The group also cautioned any buyer that it would take years of hearings to get permits issued to make changes to the property. Then, on April 30, the editorial board of the Union-Tribune came athwart: “It would be a shame if this public structure, the venue for countless public events, reverted to a private residence or, worse, were demolished by a new owner. The only way to ensure the future of the house as a public building is for UCSD to retain it and make the necessary repairs.” The piece concluded: give the fund-raisers more time. One $500,000 check was given by Mrs. Pauline Foster of Rancho Santa Fe. Arthur Brody, Malin and Roberta Burnham, and Jerome and Miriam Katzin, through their foundations, gave $100,000 each. And Donald and Darlene Shiley kicked in $100,197. With these funds secured, plus Dynes’s adding $1.45 million from his office and a pledge from the university to raise another $1 million, UCSD vice chancellor John Woods sent a letter to UCSD’s office of business and finance requesting that the pending sale of the University House be canceled. Coyle has also seen invoices showing that architect Wally Cunningham was paid $440,000 for work which included the design of a new residence on the University House site. The struggle over house and remains, though, was just getting started. The Native American dead have been at rest in San Diego County for thousands of years. Some still lie in the sandy soils of La Jolla. Until the last century only a garden hoe ever broke a clod around their heads, jostling a breastbone or femur. But, inevitably, the hoes became shovels, and the shovels became gas-powered. In our day, when coastal homeowners unearth 100 cubic yards for a swimming pool, bones pop up — a skull, a vertebra, a hand. In such an event, the law says the coroner must be called. If the coroner decides the bones have been there a long time, he calls a Native American monitor like Carmen Lucas to oversee the find. When the 72-year-old Laguna Indian arrives at the site, she says she can feel the disturbed spirit, wailing at being unloosed. “The poor soul,” Lucas tells me, has been rudely returned from the afterlife, her long journey interrupted. “I can’t tell you how painful it is,” she says. There’s as much anguish for Lucas as there is for the disinterred. Neither can rest until the bones are reburied. Though the gray-haired Lucas is not a Kumeyaay, she works with them on repatriation causes. She often scolds nonnatives who want, as she says, “only jewels, diamonds, and money.” She advocates for “our cultural resources and our spiritual connections to the land.” One La Jolla site she is contesting is along Spindrift Drive, which parallels the coast. Digging there unearthed remains in excess of 5000 years. On Roseland Drive, which intersects Spindrift, Lucas was watching a San Diego Gas and Electric backhoe cut a trench for new utility lines. “It chopped an inhumation in half,” she says. “It was a woman. They didn’t know what to do. ‘Should we take half of her out and leave the rest?’ ” Lucas told them to stop. At a nearby house on Roseland, a woman wanted to put in a swimming pool. Lucas red-flagged this project in a letter to the City. She learns of these things, she says, because La Jolla residents “know everything that’s going on,” in particular, any construction that may alter property values and views. The City ignored her letter, she says. Later, Lucas arrived at the site to find three inhumations out of the ground. (At such moments, Lucas says a prayer: “For these old souls, I say, ‘Dear God, forgive us. We’re in a different society.’ ”) Worst, the dirt was dumped as fill on Mount Soledad. She’s been trying to get that dirt returned, without luck. Archaeologist Malcolm Rogers found 11 burials in 1929 and 1936; 6 burials were discovered in 1947 and 1948; 2 in 1949 by a Scripps ichthyologist; another in 1950 from under a patio area; and 6 more in 1956. This find became known as the “double burial” because of the unique configuration of the adults: a young man was laid beside an older woman whose feet were on his head; two fingers of his hand were cut off and put into his mouth. Kennedy, who today will not speculate on the meaning, says that no one, before or since, has ever seen such an arrangement. The main issue here for the Kumeyaay is that they want those 29 skeletons — or any bones removed from their burial grounds in the county — returned to them for reburial. The Museum of Man agreed to “hold the 1976 burials,” according to UCSD records. The burials eventually were sent from the museum, perhaps as late as 2000, to the Smithsonian Institution on a “study loan.” Last October, almost 30 years after their discovery, the remains Kennedy found were sent by the Smithsonian to the San Diego Archaeological Center. Previously, the tribe has employed Mayes to look at remains, evidently trusting her spiritual sensitivity for the living and the dead. She will not do DNA testing, because the test destroys tissue, which the Kumeyaay oppose. With her analysis, Mayes will see whether or not the 1976 remains show ancestral links to present-day Kumeyaay. Establishing that relationship is key to repatriation. Depending on the condition of the bones, such a determination can be very difficult if not impossible. For the Kumeyaay and for all Native Americans, the right to repatriate the remains of ancestors was made law in 1990 with the passage of the Native American Graves Protection and Repatriation Act (NAGPRA). This act safeguards Indian gravesites from disruption and creates a process by which Indian exhumations can be identified and returned to the tribes. Thus, the act covers the 29 remains from the University House site, no matter when they turn up, and all future finds on campus, because the university is a federally endowed institution. Local archaeologist Ronald May, in a letter to the State Historic Preservation Officer, wrote that having seen “one human inhumation buried on the Chancellor’s grounds,” he believes “the property meets the California definition of a cemetery under the California Health and Safety Code. In January 2007, three tests were done at the University House site to determine whether remains were present. The first test, using ground-penetrating radar, looked for “anomalies,” which could be buried objects found near gravesites, such as prehistoric hearths or house pits. UCSD’s draft environmental impact report states that radar picked up 43 anomalies (discounting utility and irrigation lines). Many but not all of these anomalies came from the home’s original construction. Courtney Coyle notes that no Indian monitor was invited to oversee the tests. Once the Kumeyaay were made aware that UCSD was testing, they insisted a monitor be allowed on site. The second method, geotechnical testing, or drilling boreholes, turned up fragments of marine shells, ground stones (manos and metates), and flakes from stone tools. This test was halted, with a monitor present, when one bore brought up a fragment of human bone. The third method was canine forensic investigation, in which trained dogs “alert” when they smell human bones. Nessie, one of three dogs used, was trained in Europe on 2000- to 3000-year-old bones. Each dog working the site separately alerted. Scents were particularly strong in the rose garden, where all three howled. Still, one must ask, why did these tests have to be done if 29 inhumations have been found in the last 80 years? This is the question that bedevils the Kumeyaay. If UCSD’s draft environmental impact report concluded that it is “possible that human bone is present as intact burials,” then it was the Kumeyaay’s affiliation to those bones that was on trial. Kumeyaay anger that their affiliation is questioned erupted at a meeting in January 2008 when Steve Banegas, chair of the Kumeyaay Cultural Repatriation Committee, and 20 Kumeyaay tribal leaders met with 6 members of the NAGPRA Working Group from UCSD. The school formed the NAGPRA group to decide whether to return to the Kumeyaay the three skeletons unearthed at University House in 1976. As the meeting wore on, it became clear that the Kumeyaay felt the group had come to bargain repatriation of the skeletons for the Indians’ blessing on the University House project. Banegas said he was “dumbfounded” that the tribal members had to prove, yet again, that they are the descendants of the people who populated the La Jolla bluffs 10,000 years ago. Banegas was livid, his voice rising: “I can’t help but think you’re removing us as the most likely descendant. Are you here to help us get our people back or not?” It had been proven, he said, via artifacts, culture, and the oral tradition that the Kumeyaay are the aboriginal people of Southern California. He noted that many repatriations of remains to the Kumeyaay had already occurred: from the Spindrift site in La Jolla; from Encinitas and Rancho Santa Fe; from the Silver Strand in Coronado, the Laguna Mountains, and multiple diggings in the Cleveland National Forest. Paul Cuero Jr., chairman of the Campo Band, complained bitterly. “The only reason this committee was put together is [for] the chancellor’s house; we got remains from you guys already.” Cuero believed that whoever was advocating to rebuild University House wanted “us to okay that house,” that is, allow the demolition. “We’re not going to talk about that,” Cuero said. He concluded that UCSD wanted its committee to find, once and for all, no link between the people buried there and the Kumeyaay. According to tribal leaders, the Kumeyaay have “always been here.” Like most Native Americans, the Kumeyaay don’t accept modern theories about their “arrival,” such as by crossing a land bridge from Asia or paddling across the North Atlantic from Europe during the Ice Age. Whenever the Kumeyaay are asked to give evidence of cultural affiliation, they present legends, poems, songs, and artwork that say they came from the ground they occupy today. One example is a ground painting, photographed and documented in 1910. This painting, some 15 to 18 feet in diameter, was done in the tradition of the Kumeyaay’s “propensity for creating maps of the visible universe, the surface of the earth and the celestial sphere,” wrote an anthropologist who examined the photo in 2001. Not only do the Kumeyaay cite cultural evidence, they also cite archaeological proof. Shoreline and underwater studies by UCSD archaeologists have shown a thriving native community here going back 15,000 years. The California Assembly Joint Resolution 60 says that the Kumeyaay Nation has occupied and traversed Southern California and Baja California from the Pacific Ocean to the desert approximately 75 miles north and 75 miles south of the international border separating the United States and Mexico for a thousand years. Some of the NAGPRA Working Group were not convinced that the Kumeyaay are the most likely descendants of the 1976 remains. They cited the work of Smithsonian Institution osteologist Douglas Owsley. Owsley dated the Kennewick Man, a skeleton found on the banks of the Columbia River in 1996, to be 9300 years old. Owsley estimated the University House remains to be between 9590 and 9920 years old, which predates Kennewick Man. The problem is, how do we know that the Kumeyaay descended from the people who lived here 10,000 years ago? During the meeting between the university’s NAGPRA group and the Kumeyaay tribal leaders, Margaret Schoeninger, a biological anthropologist at UCSD, got the brunt of the Kumeyaay’s unhappiness. While she said she understood the tribe’s frustration with having to date their origin, she offered little else than more bureaucratization: we have to compile evidence that speaks to the bones’ identity and write a report for a UC campuswide advisory group that, in turn, will make a recommendation to the office of the president. Banegas asked pointedly: Would the evidence they’d already given, that day and in the past, satisfy the committee? Schoeninger said she couldn’t say what the group would recommend. Her statement incensed Banegas. Despite everything, he said, “We still have to prove we are the most likely descendants, that these people are my relatives. Short of them rising from the dead and speaking, what more do we have to do?” Schoeninger’s response was DNA testing, which has produced some conclusive results on remains in Alaska: “That would be like bones getting up and talking,” she said. The commission voted 6 to 0 to place the University House on the California register. It also recommended that the house be placed on the National Register of Historic Places. Coyle says that because of this vote, planners would have to work with the state historical office and “come up with stronger justifications” for why a historic home needs to be torn down. Meanwhile, UCSD had completed its final environmental impact report, which the university would present to and, they hoped, get certified by the regents. As required by law, the final report discussed alternatives to the chosen plan: among them was one to put a new home on piers and another to dismantle and relocate the home off site and build a new house on site (at a cost of $18.3 million). The school still favored the demolish-and-rebuild plan. UCSD noted that the property met only one of four criteria for historic-home preservation: the Pueblo Revival house had “distinctive style characteristics of a type, period, region, and method of construction.” Other criteria for saving the home — association with important events or trends, association with important persons, as a record of historic-home construction — did not pass muster. In mid-January, officials from UCSD, including Chancellor Fox, presented the final report to the regents. UCSD said it was aware of the home’s historical significance and offered, as a concession to preservationists, to document its history before they tore it down: filming a documentary of the property, writing a narrative-descriptive history, and donating what is salvageable from the demolition to the La Jolla Historical Society or a museum. In the biological realm, UCSD acknowledged that demolition and rebuilding would have a “potentially significant” impact on raptors, the California gnatcatcher, and coastal sage scrub. If birds were breeding nearby, the university would halt construction. Crews would also avoid damaging native plants. If UCSD found additional human remains, this would have a “significant” impact on the project. Any such discoveries would mean construction would stop and the coroner be notified. In keeping with the Native American Graves Protection and Repatriation Act, the remains would be turned over to the most likely descendant. Soil with human remains would not be removed from the site. The remains might be reburied on the property or wherever the most likely descendant agreed to have them buried. The final environmental impact report concluded that the original option — demolish and rebuild — remained the best, although now it was called the “reduced-scope alternative.” This alternative was chosen because it avoided “the underground anomalies discovered in ground-penetrating radar testing.” (The report stated clearly that disturbing historical, cultural, and archaeological resources was “unavoidable.”) Its cost, $7.9 million, would be slightly higher than the original estimate. In the end, due to the advocacy of archaeologists, preservationists, the Kumeyaay, and Carmen Lucas and Courtney Coyle; the vote of the State Historical Resources Commission; and letters from Larry Myers, Christine Kehoe, Denise Ducheny, and an 11th-hour letter from the California Coastal Commission, reminding the regents that UCSD had forgotten to apply for a coastal development permit, required of any new coastal construction, the regents, with outgoing UC president Robert Dynes in attendance, chose not to certify the final environmental impact report. They voted to continue the item until their March meeting, at which time all parties would be invited to present their alternative plans for the future of the University House site. Sometimes public opinion can turn an institution. In March, at a meeting on the Viejas Indian Reservation, UCSD’s change of heart suddenly became evident. The meeting was called by Carmen Lucas and the Kumeyaay Cultural Repatriation Committee. They invited the California Native American Heritage Commission to determine if the commission could help protect the sacred site on which University House sits. In attendance were local tribal leaders, archaeologists, and officials from UCSD. After hearing testimony from several speakers about what constitutes a cemetery, the commission voted to declare the seven-acre La Jolla site a burial ground. Under the California Public Resources Code, this designation gives the property extra protection against further disturbance. Halfway into the meeting came UCSD’s bombshell. Vice chancellor of resource management and planning Gary Matthews announced that the university had scrapped the “reduced-scope alternative” and was starting the University House project over. From scratch. This time the school will, he said, involve all parties, including the Kumeyaay. The university acknowledged that the Kumeyaay are the most likely descendents of the remains still on site. And UCSD had abandoned plans to demolish the house. With a new public-review process, the school will “renovate the house and minimize the footprint,” Matthews said. Why the change? When the UC regents did not certify UCSD’s final environmental impact report, the regents, in effect, told UCSD that its plan was not acceptable and it needed to start over. Does this mean there will be no digging? The commissioners noted that any renovation will cause some ground disturbance — for example, trenches for upgraded utility lines. Matthews said that UCSD’s new design will “minimize the impact to cultural resources.” A new design means a new multiyear bureaucratic process begins: the university finds itself in the same position it was in four years ago, when UC president Dynes called for a study of University House and for its demolition.